field and pick the pumpkin of your choice, but if you'd rather browse the ones that have already been picked, there is a great variety to choose from. One thing I discovered this year is that there is such thing as a gray pumpkin. I fell in love! After our daughter picked the six most perfect pumpkins, we visited Gallrein's deli and candy shop. It is such a quaint little county spot with dim lights, round tables and food that smells delicious. On Tuesday's and Thusday's you can visit the property and grab lunch. My daughter browsed the homemade candy with wide-eyes and eventually chose a slice of peanut butter fudge with candy corns on top. It was delicous to say that least. The last thing that we did at Gallrein's on our visit was check out the petting zoo. For one dollar you can purchase an ice cream cone with animal feed in it for the animals, then you can visit the petting zoo where there are donkeys, llamas, pigs, rabbits, chickens, kangaroos and even two camels. Be warned, if you visit the petting zoo at Gallrein Farms, the camels will want all of your animal food! My daughter especially loved seeing the two kangaroos that live on the farm. 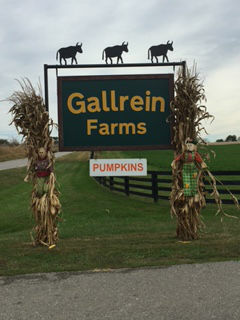 Although our visit to Gallrein's Farms consisted of candy, the petting zoo and browsing for small pumpkins, there is so much more to do. There is also a playground, haystacks, games, shopping for home decor, and apple picking. 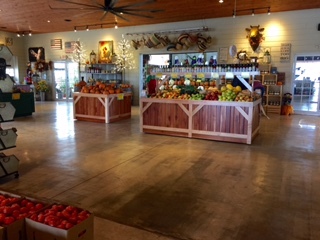 If you're looking for a hidden gem in the Lousiville area, check out Gallrein Farms!